Daniel Ben-Ami is a journalist and author based in London. Visit his website here http://danielbenami.com/ . 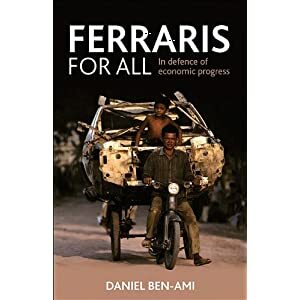 His new book, medical Ferraris For All: In Defence of Economic Progress, treat is published by Policy Press. The economic and financial crisis of the past three years has led to widespread criticism of economics from the public and much soul-searching among economists themselves. There is a pervasive sense, viagra even within the profession, that the recent turmoil has found the discipline wanting. Many would accept that a new economics is needed. An approach that is better able to help policy-makers anticipate and tackle economic challenges. By far the most high profile initiative aimed at tackling the perceived shortcomings of economics was the establishment of the Institute for New Economic Thinking (INET) ( http://ineteconomics.org ) in 2009. The institute, founded with a $50m pledge by George Soros, says it: “believes in empowering the next generation, providing the proper guidance as we challenge outdated approaches with innovative and ethical economic strategy”. Among the luminaries on INET’s advisory board are several Nobel laureates (George Akerlof, Amartya Sen, Michael Spence and Joseph Stiglitz), two former chief economists at the International Monetary Fund (Simon Johnson and Kenneth Rogoff), high profile economics writers (John Kay of the Financial Times and Anatole Kaletsky of the Times), and many others. Additional notables spoke at its inaugural conference including Dominique Strauss-Kahn (the managing director of the IMF) and Adair Lord Turner (the chairman of Britain’s Financial Services Authority). But the high-powered character of INET’s leading supporters itself raises an intriguing question. In what sense can the economics they advocate be considered genuinely new? Although some accounts have portrayed INET as a radical organisation, bent on overturning the economic orthodoxy, it is hard to take such claims seriously. Many of INETs supporters apparently consider themselves critics of the mainstream but it is hard to avoid the conclusion that they are themselves pillars of the establishment. Since there is no official statement of INET’s thinking it is difficult to critically assess its claims to newness. There are certainly significant differences between the leading thinkers who support the organisation. But Kaletsky’s Capitalism 4.0, his recent book suggesting the world is entering a new era of economic pragmatism, is a good starting point. In it he argues that the recent economic and financial crisis has discredited “market fundamentalism” (free market economics) and paved the way for its replacement by a less doctrinaire form of economic thinking. Kaletsky suggests that the new economics will satisfy three conditions. First, it will accept that a market system is not a static system in equilibrium but one that is constantly evolving. Second, it will have to accept that effective government and dynamic private enterprise are symbiotic. Third, it will need to focus on the inherent unpredictability of human behaviour and economic events. The striking thing about this list is that it is so mainstream. It would have been accepted as a moderate list well before the crisis of 2008. Even in the economics departments of elite American universities it would have been accepted by many. In the world of practical policy it is totally line with the orthodoxy. Take Kaletsky’s final points about the unpredictability of human behaviour. Daniel Kahneman and Vernon Smith won the Nobel prize for their work on behavioural finance back in 2002. Admittedly Kahneman is a psychologist but there are many other influential proponents of behavioral economics including Robert Shiller and Richard Thaler (of “Nudge” fame). The notion of the state and market working together is if anything even more mainstream. Outside of the world of high economic theory it is hard to find many economists advocating a state as limited as that favoured by the likes of Milton Friedman – essentially providing a framework for law and order as well as key public works. For example, despite all the talk of the “Washington Consensus” in the developing world, the World Bank’s annual World Development Report argued explicitly against the idea of a minimal state as far back as 1997. Economic practice was even more different from that favoured in the textbooks. Even before the crisis struck – in 2006 state spending in Britain was equivalent to about 38% of GDP and in America it was about 35%. – and since then it has risen significantly. America, often viewed as the bastion of market capitalism, the state was responsible for huge public spending programmes, an activist monetary policy and extensive forms of regulation. It is hard to avoid the conclusion that Kaletsky is over-estimating the difference between economics before 2008 and since. Free market economics, or neo-liberalism as some prefer to call it, had a brief heyday in the late 1970s and early 1980s. But since then economics, certainly in practice, has taken a more pragmatic turn. Even the contemporary discussion of the need for cuts is typically pitched as a regrettable necessity to balance the books rather than as part of an ideological drive to roll back the frontiers of the state. Of course it is unfair to pick on Kaletsky but it is hard to find radically new ideas from other proponents of the new economics either. For instance, Joseph Stiglitz, not only a Nobel laureate but a former chairman of President Bill Clinton’s Council of Economic Advisers and chief economist of the World Bank, also fails to propose novel ideas. In Aftermath (Allen Lane 2010) he suggests less emphasis on material consumption and more on protecting the natural environment. However, the notion of sustainability, which is essentially what he is advocating, was adopted as United Nations policy in the 1980s. It is had to resist the conclusion that the advocates of new economics are more interested in rescuing mainstream economics than burying it. No doubt they want changes of presentation and emphasis but the fundamentals of the viewpoint they uphold is essentially unchanged. None of this is to suggest that all is well with orthodox economics. There is certainly much that needs to be done to strengthen the discipline. But before rushing to declare a new era or to devise a new economics perhaps it is time to rehabilitate what are essentially old ideas. In particular the close link between economic growth and social progress, central to Adam Smith’s political economy in the eighteenth century, would be an excellent place to start. * Recognising the importance of economic growth. Contemporary economics is incredibly defensive about the potential of rising output to improve human welfare. Any talk of growth is hedged by numerous caveats including the notion of environmental, moral and social limits. Others want to redefine prosperity in non-material terms. Now, at a time when austerity is starting to be imposed, it is more importance than ever to emphasise the importance of growth. * Transforming the third world rather than sustaining poverty. The aspiration should be to transform poor countries into rich ones rather than simply ameliorate the worst excesses of poverty. Scarcity should be abolished worldwide. * Promoting innovation. Rediscover the importance of key principles such as taking risks, be prepared to engage in “useless” research such as the Large Hadron Collider, working hard and expecting failures. * Reducing regulation. This should involve reducing not only the number of rules – “red tape” – but what could also be called “green tape”: regulations that embody the notion of limits. These should include the precautionary principle and sustainability; both of which embody a cautious and narrow approach to economic progress. * Ending the obsession with bankers. The moralistic obsession with “greedy bankers” is a distraction from the vital task of rebuilding a healthy economy. * Remembering that the economy should not simply be viewed from the perspective of the consumer. Humans are not just consumers of goods and services but producers who can find solutions to the problems they face. The power of human ingenuity to overcome economic challenges should not be underrated. Once some of the old insights of economics are rediscovered we will be in a better position to tackle the genuinely new. is published by Policy Press. An annualised figure of 17.9% for growth in the first half of 2010 is pretty staggering for a 5 million strong island nation with GDP per head (on a PPP basis) of $50,000. When I see figures like this, I wish there was much more interest and debate on how the UK could lift it’s own paltry trend growth rate. Right now it stand at just over 2% and to take us technically out of economic decline, i.e. above the world growth rate, it needs to be about 5% or more. Instead, we seem to be more interested in tiptoeing around the margins, engaging in the latest fashions like nudge economics, when clearly what we need is an almighty shove ! New car sales – fell in July, registrations from business customers fell 6.5 percent, private customer registrations were down 28.5 percent on the year – blamed on end of scrappage scheme. June industrial output – unexpectedly fell 0.5% rather than a forecast rise of 0.2%. This was blamed on earlier than usual, i.e. in June rather than August maintenance on oil and gas fields, thus preventing full extraction. Company failures in sharp decline, personal insolvencies may have peaked – according to the Insolvency Service. RICS UK Housing Market Survey – shows first fall in a year. 8% more surveyors reported a fall than a rise and the number of new vendor instructions which in effect measures the amount of properties coming to the market, increased. 33 per cent more surveyors reported a rise rather than fall in properties to their books, up from 28 per cent in June. Philip Inman: Mystery of Britain’s missing exports “At the Bank of England they are scratching their heads. Across town at the Victoria Street offices of Vince Cable’s Department for Business, Innovation and Skills there are the same perplexed looks. Everyone is asking why UK businesses are unable to export their way out of recession“. The Guardian. Jeremy Warner: Mervyn King should stop complaining about bank lending and try more QE “What is obviously true, however, is that demand for working capital will increase sharply once the economic recovery takes hold, and that as things stand, the banks won’t be able to finance it. The still impaired state of the banking system could therefore put a powerful brake on growth. The Bank of England is actually not as impotent in all this as it likes to pretend. In fact it could quite easily assist in the provision of small business lending. Unlike the Federal Reserve in the United States, the Bank has concentrated virtually all its £200bn of “quantitative easing” on UK government bonds, or gilts” Daily Telegraph. Russia, not known for being a hot place, has been having an extended heatwave. Typically in Moscow, average peak July and August temperatures are 22 degrees celsius but this year all records have been broken and on July 29th reached 39.2 or 100 degrees fahrenheit. This has led to droughts, tinder dry conditions and of course fires dramatically reducing the grain harvest. “ . . .remember, there was a global wheat glut until six weeks ago. Stocks are at a 23-year high. Prices are barely more than half the peak in 2008. The US grain harvest is bountiful; Australia, India, Argentina look healthy. The Reuters CRB commodity index is no higher now than in April. Last week’s commodity scare looks like an anaemic version of the blow-off seen in the summer of 2008“. And don’t rule out the increasing impact of research (briefly touched on below) that shows that grains are inimical to the human diet which could turn agricultural economics upside down. 3rd August: British Retail Consortium July Shop Price Index – annualised at 2.5% in July compared to 1.7% in June – “due to higher animal feed and wheat costs, pills and strong rises in the price of other commodities such as palm oil, ed cocoa and soya oil”. 4th August: Halifax House Price Index for July – up 0.6% compared to an expected fall of 0.3%. Amongst my somewhat copious pile of holiday reading books, I have a hardback edition of Crisis Economics by Nouriel Roubini – aka Dr. Doom – which I much look forward to reading (after finishing ploughing through Tom Bower’s weighty tome on Oil – Money, Politics, and Power in the 21st Century – of which more, later). Roubini, you should know, is the man who told a sceptical crowd of senior economists at the IMF in September 2006 that “. . . the United States was likely to face a once-in-a-lifetime housing bust, an oil shock, sharply declining consumer confidence and, ultimately, a deep recession”. According to the New York Times “. . . he then laid out a bleak sequence of events: homeowners defaulting on mortgages, trillions of dollars of mortgage-backed securities unraveling worldwide and the global financial system shuddering to a halt. These developments, he went on, could cripple or destroy hedge funds, investment banks and other major financial institutions like Fannie Mae and Freddie Mac“. The long and short of it is if US growth is much less than capacity of 2.75-3.00% and comes in at 1.5% as he thinks, there will be net job losses rather than net job creation, aggregate demand will go down, negative feedback kicks in and the risk of a double dip recession rises dramatically. So if, as per my earlier post, you accept that the UK is 6 months behind the USA, then I suspect these problems will hit us from the 1st quarter of 2011.